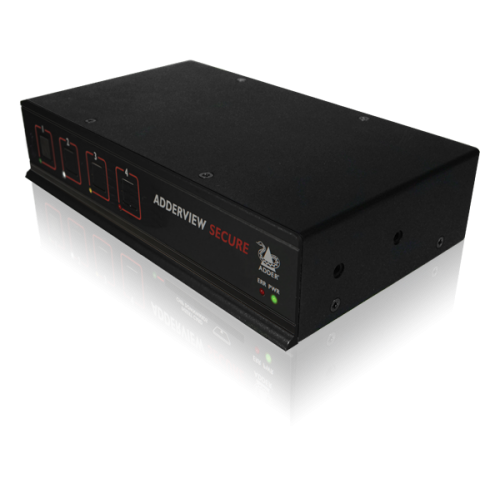 The ADDERView Secure KVM Switch allows a keyboard, monitor and mouse to be shared between high and low security systems, sometimes known as red and black networks, and is designed carefully to prevent information flowing between computers or to the outside world via emissions snooping. 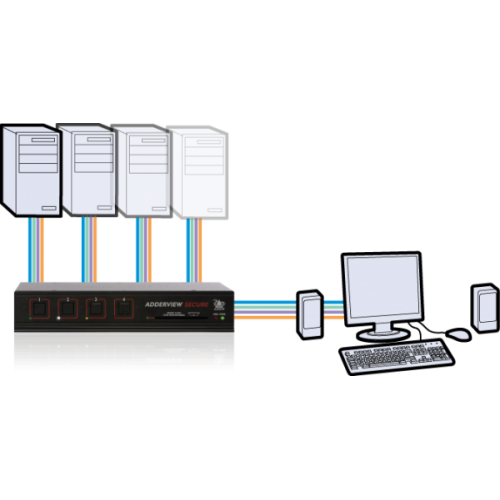 The ADDERView Secure design prevents sensitive data from leaking between ports, sensitive data leaking to the outside world and sensitive data from being stored in the device to actively combat a range of potential leakage "threats". EAL2+ Common Criteria Evaluation Assurance Level 2 (augmented by ALC_FLR.2) COMMON CRITERIA (ISO 15408) ASSURANCE LEVEL and Peripheral Sharing Switch (PSS) For Human Interface Devices Protection Profile, IAD, Version 2.1, 7 September 2010. CERTIFICATION REPORT No. CRP268. Unique one-way data paths ensure that data isolation does not rely on trusting microprocessor software, but is instead assured by hardware and prevents a hidden software weaknesses that could potentially cause data leakage. A uni-directional structure also protects against timing analysis or forced malfunction attacks and prevents computers influencing the operation of any common circuitry. The keyboard and mouse processor is powered down and reset at each switchover to thwart shared RAM leakages. Separate memories hold the num, caps and scroll states and are only accessible when the relevant channel is selected. All data buffers are cleared once they have been used. Microprocessors are one time programmable and don't contain reprogrammable flash memory. This protects against sensitive data being stored within the device and protects the software against being corrupted. To prevent small levels of crosstalk noise from being "recorded", microphone connections are banned from the design. The circuitry for each port is independently powered from the USB lead. Power line signalling is therefore blocked because different port circuits don't share the same power feed. For maximum compatibility and security USB keyboard/mouse and dual link DVI-I monitor interfaces are used and makes the AdderView Secure truly platform independent. Dual link DVI interface operates at full DVI bandwidth to ensure higher end applications that require exact video quality, sometimes at very high video resolutions, are not compromised. DVI interfaces have the added security advantage that randomising the low order video bit can make snooping much harder.